The 2014–15 Bundesliga was the 52nd season of the Bundesliga, Germany's premier football competition. The season started on 22 August 2014 and the final matchday took place on 23 May 2015. Bayern Munich won their 25th German title on 26 April 2015. Bayern Munich came into the season as defending champions, winning the championship on 25 March 2014 against Hertha BSC. Armin Veh announced that he was leaving Eintracht Frankfurt during the 2013–14 season. He had demanded that the club invest more money in the squad. Thomas Schaaf replaced Veh. Bayer Leverkusen sacked Sami Hyypiä during the 2013–14 season. Sascha Lewandowski was named interim manager. Lewandowski's interim reign lasted until the end of the season when Roger Schmidt took over. Other managerial changes include Kasper Hjulmand replacing Thomas Tuchel at 1. FSV Mainz 05 and Armin Veh replacing Huub Stevens at VfB Stuttgart. Every club received their licence. The league schedule came out on 24 June with Bayern Munich facing VfL Wolfsburg in the opening fixture on 22 August. The match ended 2–1 win for Bayern Munich, a record third straight win for the home team, on the opening matchday, in the last three seasons. 18 teams comprise the league. 15 sides qualified directly from the 2013–14 season and two sides were directly promoted from the 2013–14 2. Fußball-Bundesliga season: 1. FC Köln and SC Paderborn 07. The final participant was decided by a two-legged play-off, in which 16th-placed Bundesliga club Hamburger SV defeated third-place finisher in 2. Bundesliga, SpVgg Greuther Fürth. Announced on 3 March 2014. Announced on 25 April 2014. Announced on 10 May 2014. Announced on 12 May 2014. 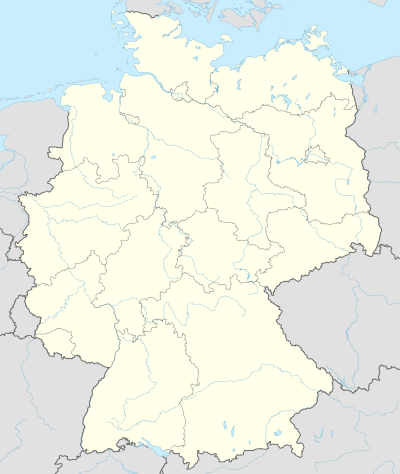 ^ a b Since the winners of the 2014–15 DFB-Pokal, VfL Wolfsburg, qualified for the Champions League based on league position, the Europa League group stage spot was passed to the sixth-placed team, Schalke 04; and the Europa League third qualifying round spot was passed to the seventh-placed team, Borussia Dortmund. The team which finishes 16th, will face the third-placed 2014–15 2. Bundesliga side for a two-legged play-off. The winner on aggregate score after both matches earns entry into the 2015–16 Bundesliga. Hamburger SV prevailed for the second year in a row, avoiding their possible first relegation. 90 minutes of regular time. 30 minutes of extra time if tied on aggregate. Penalty shoot-out if no further goals are scored. Hamburger SV won 3–2 on aggregate. ^ a b c d e f g "2014–15 German Bundesliga statistics". ESPN FC. Retrieved 4 November 2014. ^ "Bayern Munich charge ahead to leave their German rivals playing catch-up". Guardian. 28 April 2015. Retrieved 28 April 2015. ^ "Der FC Bayern feiert die erste März-Meisterschaft". Die Welt (in German). 25 March 2014. Retrieved 22 May 2014. ^ a b Weitbrecht, Ralf (3 March 2014). "Trainer Armin Veh verlässt Eintracht Frankfurt". Frankfurter Allgemeine Zeitung (in German). Retrieved 22 May 2014. ^ "Trainer Veh bereitet in Frankfurt seinen Abgang vor". Die Welt (in German). 15 March 2014. Retrieved 22 May 2014. ^ a b Marwedel, Jörg (21 May 2014). "Der ewige Bremer wird Frankfurter". Süddeutsche Zeitung (in German). Retrieved 22 May 2014. ^ a b c "Leverkusen trennt sich von Trainer Hyypiä". Süddeutsche Zeitung (in German). 5 April 2014. Retrieved 5 April 2014. ^ a b "Bayer Leverkusen name Roger Schmidt as Sami Hyypia replacement". BBC Sports. 25 April 2014. Retrieved 27 April 2014. ^ a b "Hjulmand übernimmt Tuchels Job". Süddeutsche Zeitung (in German). 16 May 2014. Retrieved 22 May 2014. ^ a b "Mainz-Manager Heidel: Trainer Tuchel will zurücktreten". Süddeutsche Zeitung (in German). Deutsche Presse-Agentur. 10 May 2014. Retrieved 22 May 2014. ^ a b "Rückkehr zum VfB perfekt: Veh übernimmt bis 2016!" (in German). kicker. 12 May 2014. Retrieved 22 May 2014. ^ a b Plavec, Jan Georg (10 May 2014). "Huub Stevens verlässt den VfB". Suttgarter Zeitung (in German). Retrieved 22 May 2014. ^ "DFL erteilt allen Klubs die Lizenz". Süddeutsche Zeitung (in German). 27 May 2014. Retrieved 29 May 2014. ^ "FC Bayern eröffnet Saison gegen Wolfsburg" (in German). Süddeutsche Zeitung. 24 June 2014. Retrieved 18 July 2014. ^ Smentek, Klaus; et al. (8 August 2012). "kicker Bundesliga Sonderheft 2012/13". kicker Sportmagazin (in German). Nuremberg: Olympia Verlag. ISSN 0948-7964. ^ "Fiat Group neuer Hauptsponsor von Eintracht Frankfurt" (in German). Eintracht Frankfurt. Archived from the original on 22 October 2013. Retrieved 21 April 2013. ^ "Der Hamburger SV trennt sich von Mirko Slomka". bundesliga.de (in German). 15 September 2014. Retrieved 15 September 2014. ^ "HSV macht Zinnbauer gleich zum Cheftrainer" (in German). kicker. 16 September 2014. Retrieved 16 September 2014. ^ "Schalke trennt sich von Keller - di Matteo übernimmt". bundesliga.de (in German). 7 October 2014. Retrieved 7 October 2014. ^ "Viktor Skripnik übernimmt – Robin Dutt freigestellt". bundesliga.de (in German). 25 October 2014. Retrieved 25 October 2014. ^ "Nach Veh-Rücktritt: Viele Baustellen in Stuttgart". bundesliga.de (in German). 24 November 2014. Retrieved 24 November 2014. ^ "Stevens: "Ich freue mich auf die Herausforderung"". bundesliga.de (in German). 25 November 2014. Retrieved 25 November 2014. ^ "Hertha BSC trennt sich von Trainer Jos Luhukay". bundesliga.de (in German). 5 February 2015. Retrieved 5 February 2015. ^ "Mainz trennt sich von Trainer Hjulmand, Schmidt übernimmt". dfb.de (in German). 17 February 2015. Retrieved 17 February 2015. ^ "Bruno Labbadia ist neuer HSV-Trainer". dfb.de (in German). 15 April 2015. Retrieved 15 April 2015. ^ "Hannover beurlaubt Tayfun Korkut". dfb.de (in German). 20 April 2015. Retrieved 20 April 2015. ^ "Frontzeck neuer Trainer bei Hannover 96". dfb.de (in German). 20 April 2015. Retrieved 20 April 2015. ^ "Torjäger" [Goalscorers] (in German). DFL. ^ "Scorer" [Goal + assist] (in German). DFL.